The Spanishexperto free demo lessons provide you with the opportunity to see lesson structure and style; how the grammar lessons are conducted. They also allow you to interact with the entire lesson experience by watching and listening to the video lessons and attempting various quizzes. 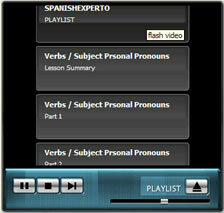 Each Spanishexperto lesson is structured and styled in much the same way, allowing you to watch and listen to the video lesson at the same time as viewing the written lessons or attempting the quizzes. The choice is yours. If you like what you see and want to have access to all our lessons go to the membership page of this website and become a Spanishexperto member today.